Marketing - Ingram Entertainment Inc.
Ingram offers monthly programs that assist retailers with their purchasing decisions by providing information on titles in easy to understand formats. Chuck’s Picks is a comprehensive list, by month, of the titles that all video stores should consider as must-haves for new release. Chuck’s Picks are highlighted in a weekly feature page in the Entertainment Preview, on AccessIngram.com, and on the monthly Coming Soon poster and flyers. Let Ingram help you select your secondary titles with Ingram’s Selects titles. Ingram’s experienced sales team reviews upcoming releases and chooses only those which have the greatest rental and profit potential. Think of it as an insider’s guide to what will perform in your store! 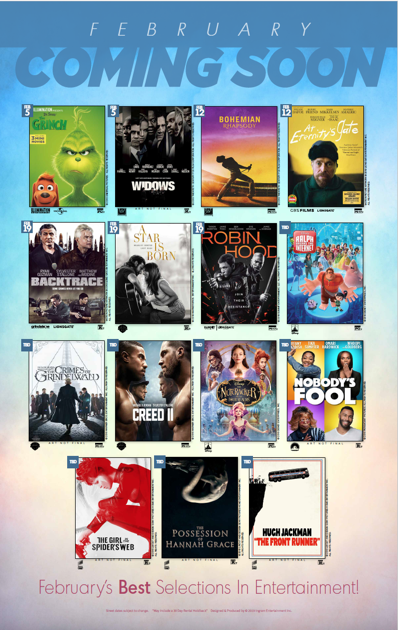 In addition to knowing you are buying the best in secondary product each month, a special Selects pull-out mini poster is available in the Entertainment Preview to help you promote the titles in your store. Ingram creates a monthly digital Coming Soon poster featuring the must-have titles that are releasing for that given month. Ingram retailers can visit AccessIngram.com and download the PDF file to print off and use to create excitement and inform consumers. Additionally, we will publish the Coming Soon poster in the Ingram Entertainment Preview for retailers.